Can't see it unless you have Google Plus. I'm having difficulty with the stroud green finsbury park overlap area. Personally I think it has to be one or the other and I would have to say to me it feels more FP. But then I live in the green area close to Crouch End so maybe that's why I think that. In terms of the Neighbourhood Forum boundaries it does need to be 'one or the other', i.e. Stroud Green needs to be in the Finsbury Park Forum or have its own. This survey will help to determine that. My own view is that it's not overly important as long as Stroud Green doesn't end up being split up between different forums or none. I did fill in the survey. Hi Arkady and all, this is great work and obviously really important - thanks for keeping us in the loop. 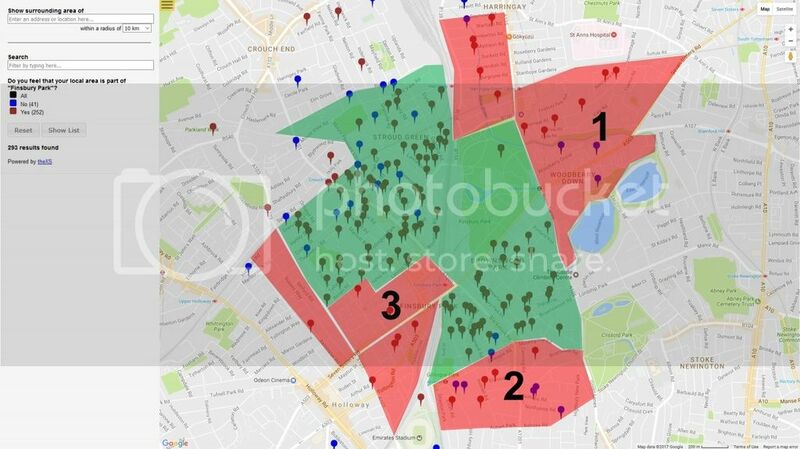 I agree that, while I don't feel too passionately one way or another, the NF for Stroud Green is likely to have pretty different objectives than the Finsbury Park one. So there's an argument for 2 separate NFs. I did fill in the form and, FWIW, I said that I call where I live Stroud Green but do feel like it's part of "Finsbury Park" - I walk my dog in the park and walk to the tube to travel. So I'm not sure that the form totally captured my opinions about the NFs! Perhaps a form that asked a direct 'yes/no' question about Neighbourhood Forums would be more useful? Again, thanks for this and I'd love to know more as things progress. "Just one week to go until we explore and discuss The Future of Culture and Leisure in Finsbury Park! A reminder of our two fantastic speakers... Melli Bond from the Park Theatre - "The role of the Park Theatre in the community, and my vision for the future" Hayley Squires from former live music venue Silver Bullet - "Connecting the Community: celebrating Music, Art, and Culture in Finsbury Park" We'd also like to take this opportunity to thank the Finsbury Park Trust for supporting the event, and our journey towards a Neighbourhood Plan. Date and time: Monday, 16 January 2017 at 7.00-8.30pm Venue: Studio Suite, Rowan's Leisure Centre, 10 Stroud Green Road, London N4 2DF Kind regards, Ricky Thakrar https://finsburyparkplan.wordpress.com "
Quick reminder about the survey: https://finsburyparkplan.wordpress.com/boundary-survey/ The steering group are hoping to firm up the boundary ready to submit to the three boroughs in March, so express your views while you can. Arkady - explain to me again what the impact of being not within the boundary would be for someone in say Woodberry Down? I don't agree with many of Hugh's criticisms, but I actually think he's right to be be concerned about the proposed boundary encroaching on Harringay. While in some ways its good that Forum boundaries are being created organically, there are problems with it too - one area potentially can 'get in first' and include territory that might be more naturally included in a different forum. @Arkady, is there no mechanism for a street to change forum, or even to belong to more than one? Belong to more than one - no. A Neighbourhood plan will form the lowest level of planning rules, and you can't have two such plans overlapping. I think that a Forum area can be amended later though. Progress! I love the new logo. ....bit late, sorry. Will be more timely next time. Includes links to the final boundary proposal and constitution. We're close to being able to submit to the three Councils for approval! The Neighbourhood Forum is now approved by all three Boroughs and they are starting to think about the Neighbourhood Plan. A good time to get involved, now much of the bureaucracy is out of the way!